As previous years the Medical Entomology and Biology of Disease Vectors has been very productive and prolific with nine peer-reviewed publications in the reporting period. The Yersin project terminated at the beginning of 2018 with several seminal publications detailing the risks of vector borne diseases in rubber plantations. Michelin Corporate Foundation sponsored this project and made a documentary film that can be viewed at the IP Laos website www.pasteur.la. We have continued the Insecticide resistance studies on Aedes aegypti and Aedes albopictus adults and larvae. We reported to Lao Ministry of Health that Ae. aegypti larvae are now totally resistant to Temephos whereas high levels are of resistance are demonstrated in Ae albopictus larvae. The Lao Ministry of Health has since decided to abandon Temephos use in Lao PDR in favor of biological insecticides like BTI. The ECOMORE 2 Project continues to monitor Aedes spp. vector populations (adults and larvae), as well as the implementation of the In2Care insecticide traps. These traps use a novel insecticide that inhibits growth and metamorphosis from larvae to adults. Furthermore, this insecticide is active at very low concentrations and is spread to other mosquito breeding sites by female mosquitoes that carry the insecticide on their legs. The project aims to reduce dengue virus circulation in the test areas in Vientiane capital. The Bat Map project is a very exciting pluri-disciplinary aimed at pathogen discovery. Given that the Lao Government is interested in increasing eco-tourism and especially cave visits in the karstic limestone regions of Lao PDR. These caves are often the habitat of both insectivorous and fruit bats that can be reservoirs of emerging pathogens both viral and bacterial. Our study identifies the bats and ecto-parasites and goes on to analyze putative emerging viruses by New Generation Sequencing. Bacterial pathogens such as Bartonella spp. and Rickettsia spp. have also been identified in bat fly ecto-parasites. 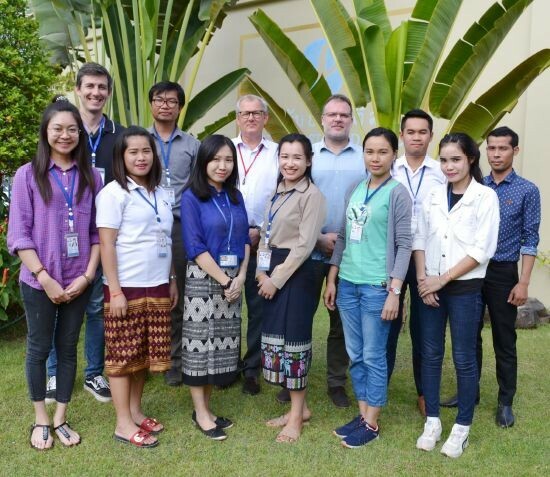 Our aim is to provide the Lao Government with as much information as possible on potential emerging infectious disease threats and the best way to mitigate the spread of vector borne diseases through efficient monitoring and novel insecticide use. +ECOnomic Development, ECOsystem Modifications, and Emerging Infectious Diseases Risk Evaluation (ECOMORE II). Entomology work package.